Today, dear readers, is day zero. It is the last day before the counting commences. It is the last day... that my wife is here. To halt the dramatics, allow me to explain that she's off to Australia for three weeks to visit her sister and her partner - my sister-in-law has just given birth to a beautiful baby girl, and my wife will be starting her journey to Melbourne tomorrow morning to help out for a few weeks. As I write this bags are being packed. In preparation for taking over the cooking duties, I made a huge vat of anonymous mash vegetables for freezing. 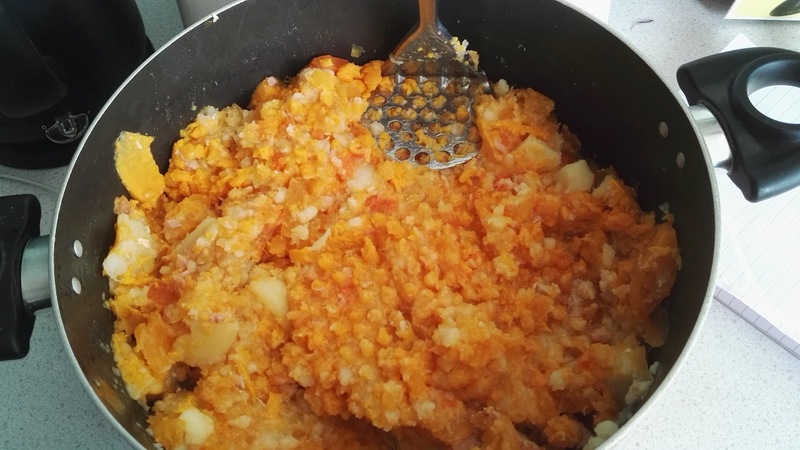 I had the bright idea, you see, that I could make a load of mashed potatoes, and mix in it some other vegetables, to get some nutrition into mine and my sons diets, to try to start off on the right foot and not be resorting to takeaways every night. 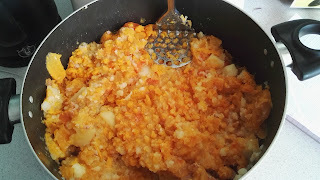 However, it's pretty obvious in the picture above that it isn't pure top-quality mashed potato, and I suspect I'm going to be eating most of that myself. I did add some bacon into the vegetables when they were boiling to add flavour, interestingly while they didn't add any flavour to the vegetables the process did succeed in sucking all of the tasty bacon flavour from the bacon itself. Eating flavourless bacon is odd, trust me. So cross your fingers for these next twenty six or so days of freedom. Perhaps by the end of it I'll have learned to cook! Good luck, Mike! I feel some You Tube adventures coming our way. I am sure you will do well. That concoction looks yummy! Best of luck, if you're in a pinch, a Canadian go-to classic, Macaroni and Cheese (also known here as Kraft Dinner). I've not had Macaroni Cheese for ages, as a kid I used to have it out of a can, I imagine doing it properly is far better! All the Very Best to your Wife and her Sister. I used to put sweed & hide it with leicester cheese, as my Son didnt and still wont eat any veg. That was until he cotton'd on ;/ Still, it was all done with good intentions. Hot sauce can save anything, Mike, I recommend a dash of Tobasco. It will be so good I will show up to have a plate or two with you. Sounds good Tim. As it happens I made a curry tonight, surprisingly enough it was wholly edible.